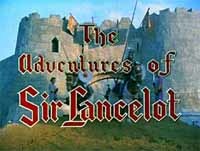 April 25th 2005 sees the release, for the first time, of the classic 1950s TV series "The Adventures of Sir Lancelot" on DVD. The series, which starred William Russell in the title role, was an early ITC Lew Grade success and is being released by Network Video after they secured the DVD release rights to over 250 ITV series last year, including "The Prisoner", as we announced in October 2004. This DVD release will be of interest to readers of The Unmutual because one episode, the black and white story "The Outcast" from 1956, features none other than Patrick McGoohan, in one of his earliest TV roles, as Sir Glavin. "It's Your Funeral" Number Two Derren Nesbitt also appears in several episodes (under the name Derry Nesbitt) as various characters. Thanks to Frank Shailes and Simon Coward for the information..